Once you get past the awe of Matt’s 22k+ following on Instagram, his feed makes you wonder why you’re holed up at your desk during banker’s hours and not exploring the beauty of Hawaii. 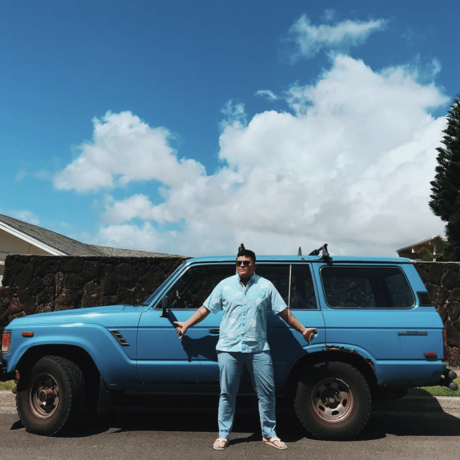 Checkered with a lust worthy lifestyle of cerulean oceans, Hawaiian skies and sandy beach days with his squad, Matt also designs minimalist ensembles for his fashion line, Matt Bruening Label. Can we have it all? We’re inspired by his ability to take the true beauty of our island culture and kill it in Honolulu’s fashion industry. Chef Moké Warren was born and raised on the island of O’ahu. He attended Kamehameha Schools and later graduated from the culinary program at Kapi’olani Community College. After graduation from culinary school he honed his skills at the five diamond Halekulani Hotel under the supervision of Chef Mavro. In 2004 Chef Moké and his wife Teri opened Moké’s Bread & Breakfast in Kailua. With the help of their kids, Keola and Leilani, the Warren Family began serving Windward residents a unique blend of healthy and hearty breakfast fare. The restaurants humble beginnings are rooted in delicious home-cooked meals: The Lilikoi pancakes are divine, our home-made corned beef hash will hit the spot, and the Kualoa Loco Moco is a perfect example of farm-to-table dining. As a digital marketing agency, we take the “marketing” very seriously. Nothing is cookie-cutter and everything is tailored to our client’s needs and expectations. We are inspired by you. Your awesome is blended with our awesome — and with our powers combined; insert Captain Planet. JK. We strive to take your stellar ideas and build them into an unforgettable campaign.What’s considered an add-on service for most agencies is a basic inclusion for our clients. We take your requirements and intentions for your business vision and incorporate them into a personalized brand guide to begin any project. This becomes the first step into our epic, creative journey to tell your story in the best way possible. At Candela Strategy Group, we resolutely believe that small and mid-size businesses create the engine that drives Hawaii’s economy. Taking care of our small business community is essential to the overall success of our island home. We focus on this engine by providing high quality business consulting services on a broad range of issues that local companies face every day. When these businesses are successful, Hawaii is successful. Together, we thrive. And best of all, we support your business at an affordable rate. We like our money, and we really like getting the most value we can out of it. Chances are, you feel the same way. That is why Candela utilizes a lean overhead model to ensure that you are not paying too much for our consulting services. Take away the expensive office and fancy artwork, and Candela is left with the financial freedom to pass savings onto you and the flexibility to structure a fee arrangement that works for your business. Win-Win; a scenario worth celebrating. Cheers to that! Honolulu Coffee was founded in 1992 with one small kiosk in downtown Honolulu. We strive daily to provide the complete Hawaiian Coffee experience. We feel that our past and future success is contingent upon maintaining and exceeding these goals. Our Hawaiian style concept stretches throughout our cafes on three different islands and our expansion in Asia. As a result, people around the world are able to experience our great Kona coffee and outstanding customer service.